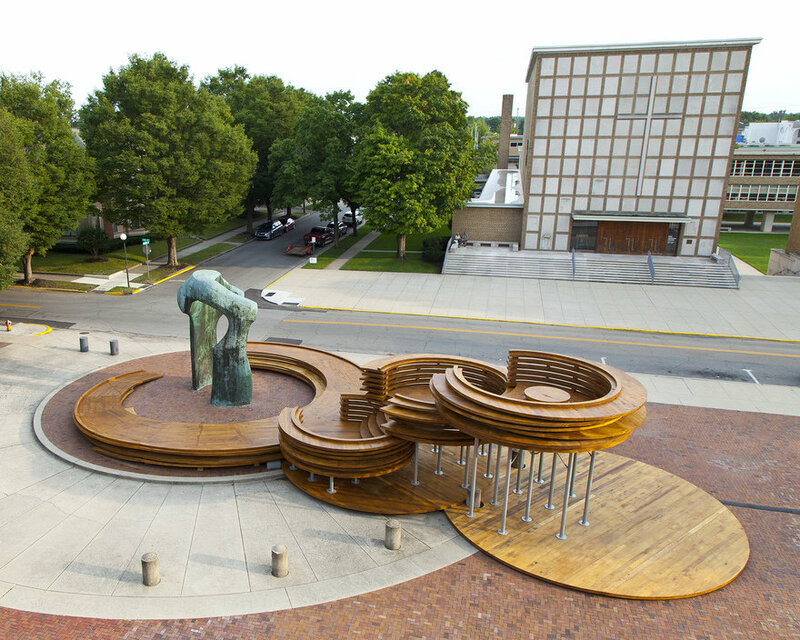 The Conversation Plinth is the First Hardwood CLT structure constructed in the US. 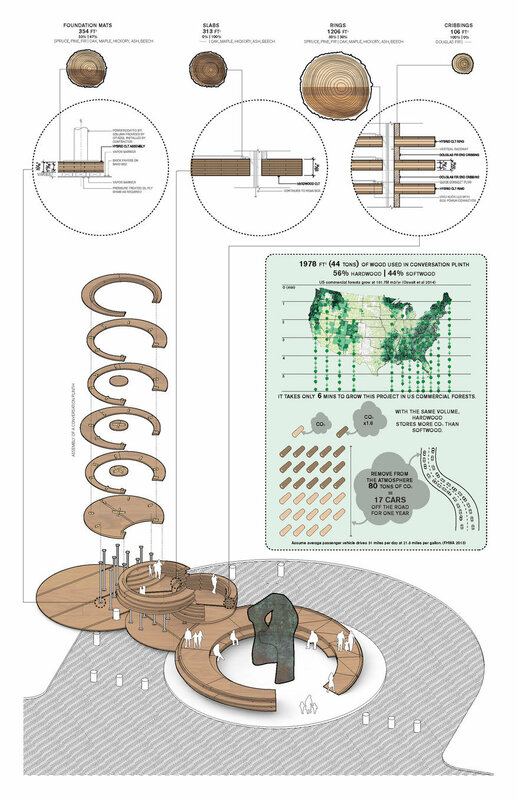 The winning proposal for Exhibit Columbus, located in midwestern architecture mecca Columbus, Indiana pays homage to J Irwin Miller and aims to celebrate the community of Columbus in the Main plaza of the city. Its form takes cues from the conversation pit in the living room in the Miller House, as well as the plinths that elevate the important landmarks immediately surrounding the site—the library designed by I. M. Pei, the First Christian Church designed by Saarinen church, and the Large Arch by Henry Moore. The installation offers a place for the community to gather and converse, and elevates people, both literally and metaphorically. 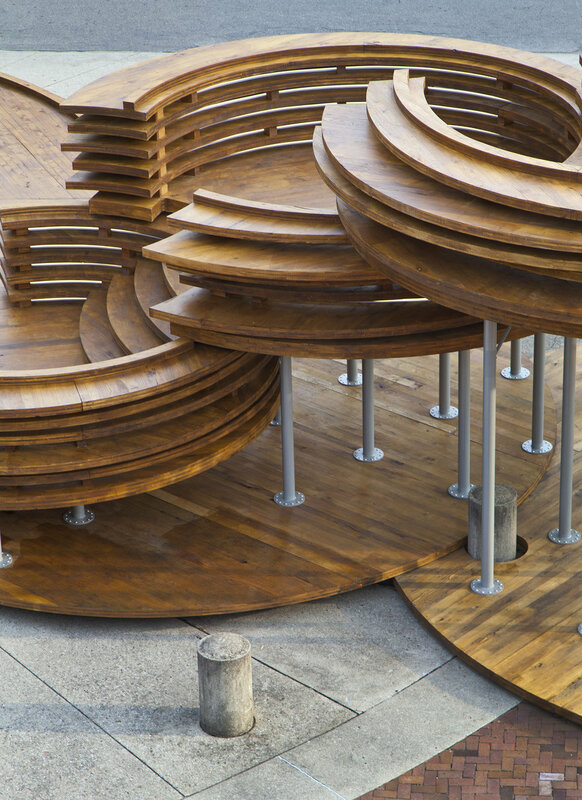 The installation is made of a hi-tech engineered timber product called CLT, or Cross Laminated Timber. Although softwood CLT already exists in the US, hardwood CLT, native and abundant in Indiana, does not. 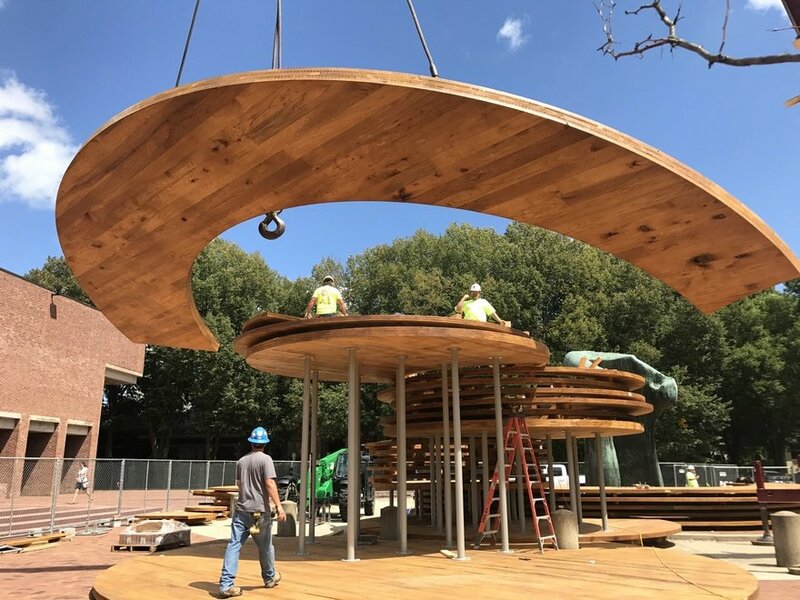 The Conversation Plinth is construction from the first ever Commercial Pressing of Hardwood CLT here in the US a research and development effort led by IKD with project partners CLT manufacturer Smartlam and timber engineer Bensonwood. 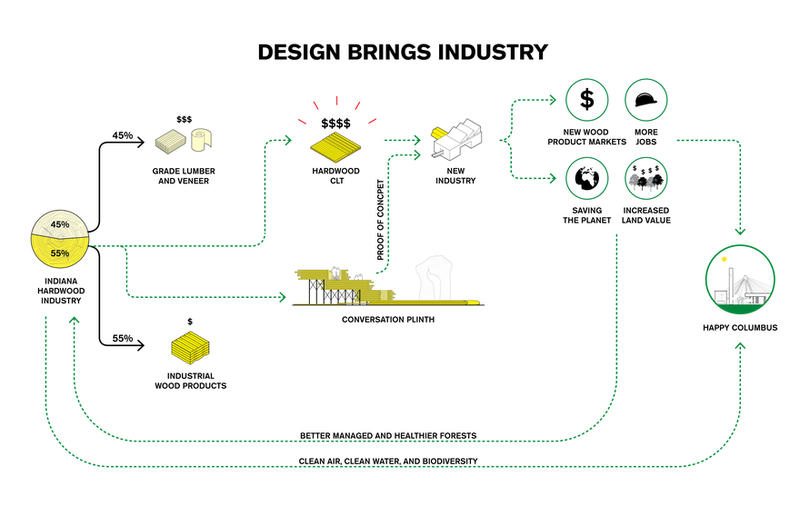 IKD was awarded a 2017 wood innovation grant by the United States Forest Service to develop this material innovation and was the only Architecture firm to be awarded out of 114 national applicants. 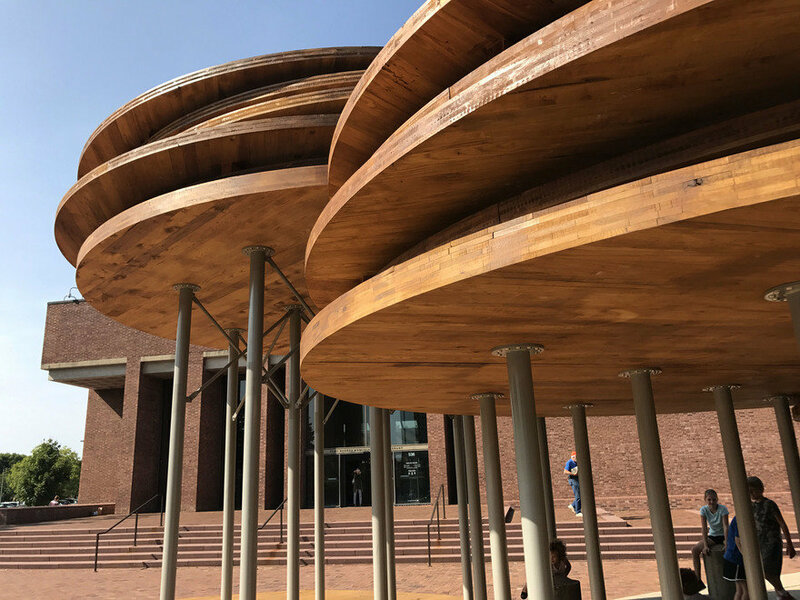 The installation and material development is intended to be a catalyst for a new timber industry by upcycling low-value hardwood that are extracted from regional forests. The proposal aims to jumpstart and accelerate the development and use of hardwood CLT fabricated from parts of logs harvested from Indiana forests that can currently only be used to produce low value wood products .This has the potential to initiate a cascade of effects: job growth in rural forestry and manufacturing, diversifying hardwood lumber markets, higher forest land value, and improved forest management practices to reduce wildfires and encourage biodiversity leading to an abatement of climate change. 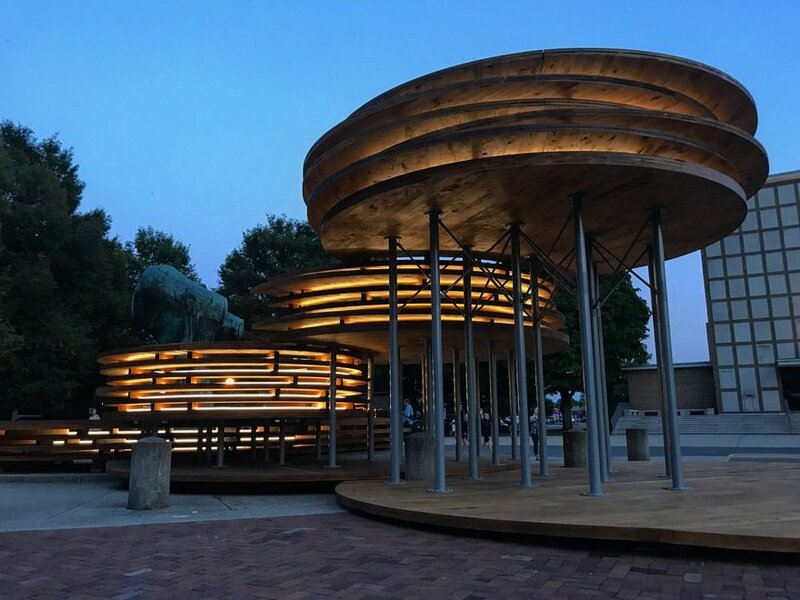 Yugon Kim and Tomomi Itakura from the architectural design firm IKD have completed the First Hardwood Cross Laminated Timber Structure in the United States named the Conversation Plinth. Unveiled at the Exhibit Columbus Exhibition in Midwestern modern art and architecture mecca, Columbus, Indiana. 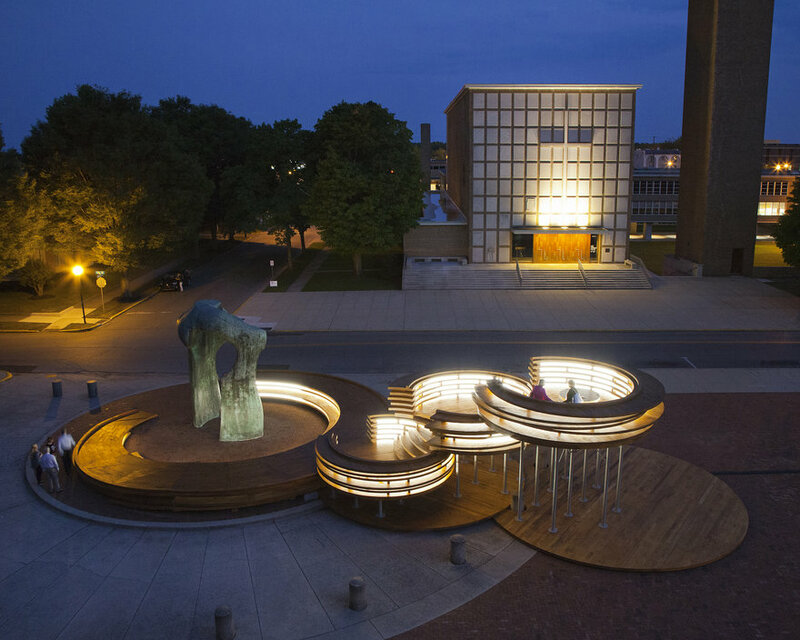 The Conversation Plinth is a winning proposal for the Cleo Rogers Memorial Library plaza that pays homage to J Irwin Miller and aims to celebrate the community of Columbus and has been installed in the Summer of 2017 in the Main plaza of the city during the Exhibit Columbus exhibition. Its form takes cues from the conversation pit in the living room in the Miller House, as well as the plinths that elevate the important landmarks immediately surrounding the site—the library designed by I. M. Pei, the First Christian Church designed by Saarinen church, and the Large Arch by Henry Moore. Illuminated at night, the project acts a lantern re-invigorating the plaza. 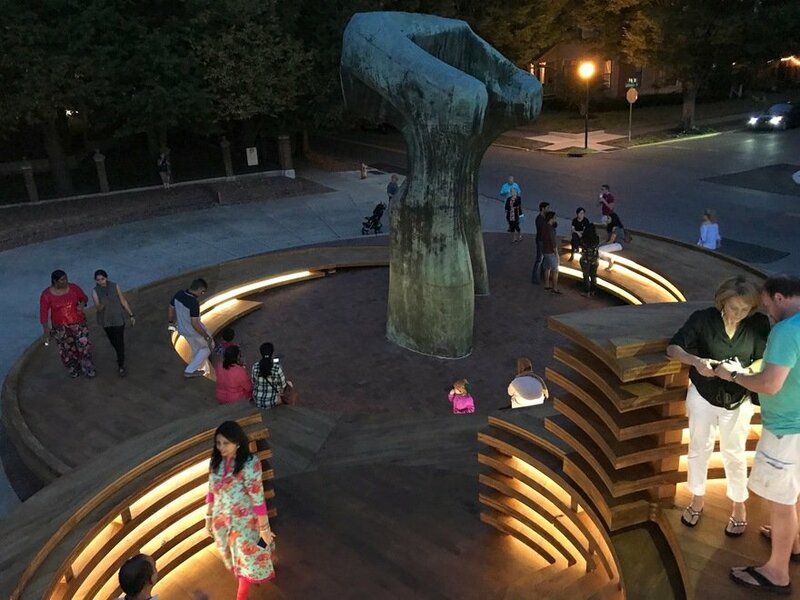 The installation offers a place for the community to gather and converse, and elevates people, both literally and metaphorically. 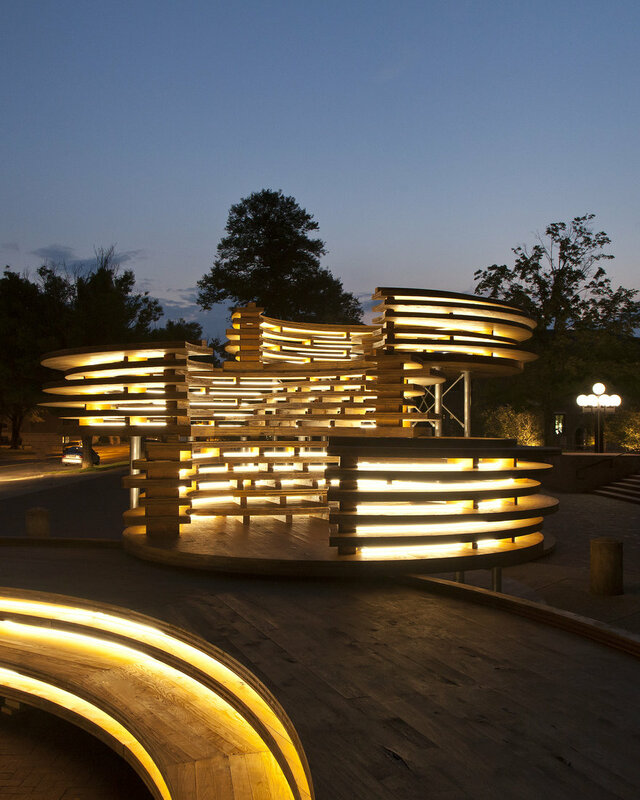 The installation is made of a hi-tech engineered timber product called CLT, or Cross Laminated Timber. Although softwood CLT already exists in the US, Hardwood CLT(HCLT) does not. 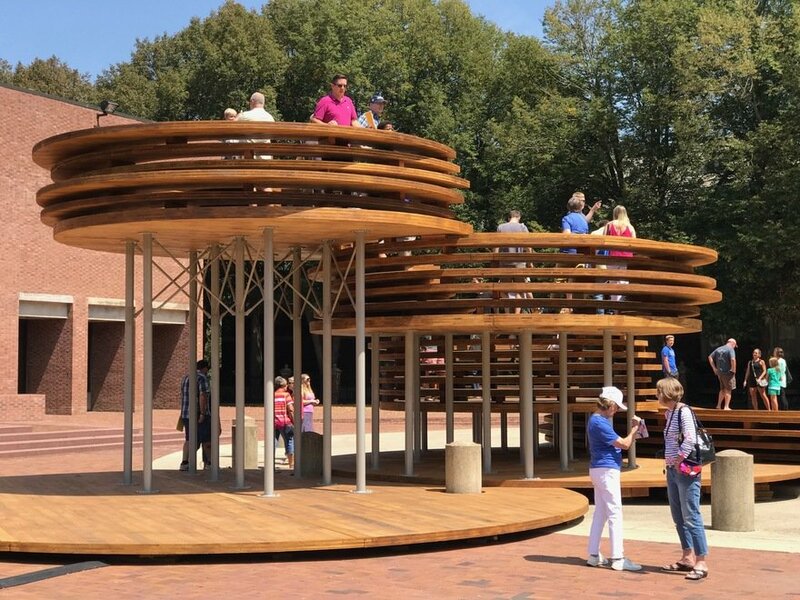 The Conversation Plinth is constructed from the first ever commercial pressing of Hardwood CLT here in the US that was developed by IKD and team partners out of mix species, low value grade 3 common hardwoods. IKD was awarded a 2017 Wood Innovation grant by the United States Forest Service to develop this material innovation for the installation and for product certification that may lead to mass production. IKD was selected from 114 national applicants and is the only architectural design firm to have won a grant this year. 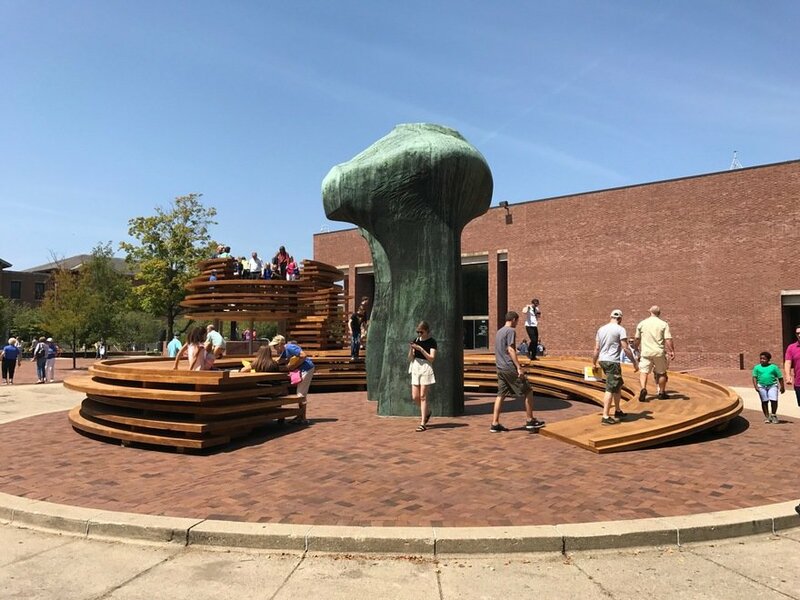 Using the Conversation Plinth as a demonstration project, IKD hopes the installation to be a catalyst for a new timber industry by upcycling low-value hardwood sawn logs that are extracted from regional forests in Indiana and the mid-west. Indiana's largest cash crop is hardwood, but over 55% of each log processed is of low value. The idea is that low-value hardwood, such as grade 3 common oak, maple, and ash, can be used to create high-value HCLT, which can then be used in commercial applications. HCLT offers numerous benefits over softwood, included superior mechanical properties, material volume savings, increased resistance to fire, and higher quality appearance in visible settings. The proposal aims to jumpstart and accelerate the development and use of HCLT fabricated from parts of logs harvested from Indiana forests that can currently only be used to produce low value wood products. It seeks to demonstrate the viability and the benefits of a new, high value timber market in Indiana and the mid-west. This has the potential to initiate a cascade of effects: positive job growth in rural forestry and manufacturing, expanding and diversifying hardwood lumber markets, higher forest land value, and improved forest management practices to reduce wildfires and encourage biodiversity leading to an abatement of climate change. The project leverages the full support of the National Hardwood Lumber Association (NHLA) and the Indiana Hardwood Lumbermen's Association (IHLA), and has secured partnerships with SMARTLAM, the first CLT manufacturer in the United States, timber structural engineering expert Chris Carbone from Bensonwood, and Clemson University's Wood Utilization + Design Institute. IKD has also partnered with the Indiana department of Nation Resources, the Hoosier National Forest office, and the Indiana Society of American Foresters. GENERAL CONTRACTOR Taylor Brothers Construction Co, inc.